A composite image is the merging of two or more images together in order to create a single image that contains elements of the original set. This is not a new concept, this was being done back in the 1800's and continued into the age of film. With today's technology, composite images are easier to create, can be quickly done, and you have the ability to develop complex concepts. The catch is you will need to purchase and learn editing software such as Photoshop. This blog will give you hints, tips, and secrets on how to create composite images and get you started but it's going to be up to you to put in the sweat and time to take your online stock career to the next level. The easy days of stock are long gone. Making money from stop signs and pictures of handshakes doesn't happen any more. These days you have to work harder for less but the difference between failure and success is your ability to rise above the competition and create images no one else can create. First of all, you need to think of composite images as a set of layers. Individual images can be stacked one upon another in order to create a new, unique picture. Each layer can be edited individually and one of the secrets to doing this is to remove the background from a particular layer and merge them together. Everyone has seen pictures like this where the different elements look very fake because the different layers do not blend together very well. Let's take a look at the image below. Here you have a young girl in a surreal scene where she is standing on a rock with a flowing wisp of fabric blowing in the wind from her dress. The image is a composite from four different pictures: (1) The background (2) the rock (3) the blowing fabric and (4) the young girl. However, there really are two additional layers, the vignette and the beam of light come from above. The girl was photographed and the background was removed using Photoshop. You can find many online tutorials on how to isolated an element from a photograph. The mountains in the background was generated with 3D software but you can use a real photograph of mountains and later in this blog I will tell you how to get background images for free. The rock and blowing fabric were also created with 3D software. The vignette was created by duplicating the background and turning down the lightness. The middle was erased with an eraser tool in Photoshop. All the elements were then placed into a single Photoshop file, resized and re-positioned as needed. Another layer was created for the beam of light from above and generated with a single click from a Photoshop brush. There are hundreds of Photoshop brushes "out there" that you can purchase for various affects. There are free brushes too but you have to be careful with those, the terms and conditions of free brushes may not allow you to create images for commercial resale. The bottom of the white dress was slowly darkened with the Burn Tool in Photoshop. The Burn Tool was used again underneath the girl and applied on the rock to create a shadow. Using the Burn Tool is a special technique for creating affects where the different layers will appear to be merged together. When you remove the background of an element in order to isolate an object, you may have a rough edge or a fringe of pixels that contain portions of the background. You may need to go around the image with the Eraser Tool to clean the edge. This can be tedious but once you are used to the workflow you will find yourself being more efficient in completing the task. Yes, it may be a bit of work isolating an object, but here's a stock photography secret: Once you have an object ready for a composite image, you can use the same object over and over for other concepts! Here you see the girl standing on a rock but in another image she could be standing on a cliff. She could be standing in the woods. Standing in a desert. Other objects can be merged into the scene. So the effort for isolating an object can pay off by using the element for other images. As you build your library of elements you will find it takes less time to create multiple images and concepts because the hard work has already been done. And you will be creating concepts no one else can do which means you will have virtually no competition! In this girl-standing-on-rock image the bottom of the dress was also worked with the Eraser and Smudge Tools in order to give the edge of softer and more natural look. It will take some time to learn how to work these elements together for this type of image but I wanted you to understand the steps that are involved for creating such an image. So how about creating a concept that is very easy to do and is yet still a unique image that most others are unable to duplicate? 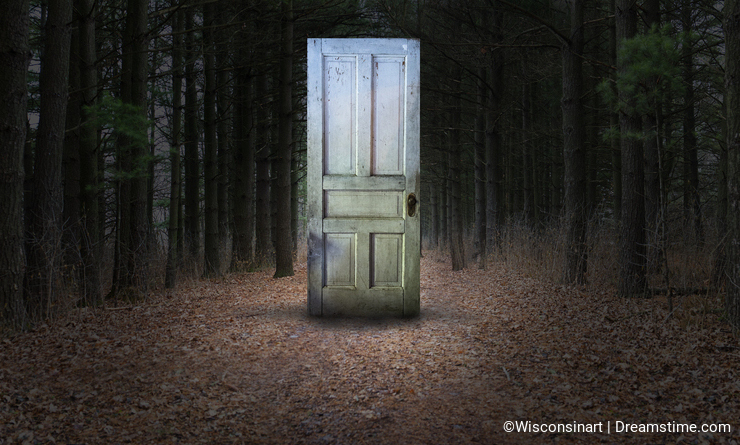 Let's look at the image below where we have a surreal door in a mysterious forest. This image was created from two other pictures. The forest background was photographed at a local park. That layer was duplicated, darkened, and then the middle was removed with the Eraser Tool. This was done to make the forest look more ominous. The door was another photograph where the background was removed. The door was dropped into the scene, resized and re-positioned as necessary. Then the Burn Tool was used to darken the bottom of the door and the same was done to the background in order to place a shadow on the ground. So as you can see, the same workflows and techniques apply to each composite image. It may take time to learn how to use the tools effectively but the fundamental steps are simple to do. The concepts you can do are limitless. You can photograph a business office, public spaces, scenes in nature and create a multitude of concepts. You can have a businessman standing on a mountain in order to create mainstream stock concepts or a child standing inside a storybook, just to name a few traditional stock photography concepts. These kinds of images stand out from the mundane child-reading-book and business-handshake images you normally see. And this is how you beat your competition. Having a library of elements is also how you increase your output for creating images. Now, before you start to run out photographing mountains and spaceships, why waste your time when you can get all kinds of background images for free and no copyrights? There is a current trend of newbie photographers who are foolishly throwing their work out into the public domain. Many of these photographers are extremely talented and put out quality work but for whatever reason, they think the way to be "discovered" is to give their work away for free, and worse, give up all rights to their work. I would hope that YOU will never put your images into the public domain because that is the worst thing a photographer could ever do. However, since a great number of photographers are doing as such, you might as well benefit from their lack of judgement. Pixabay.com is one of many web sites out there where you can download images without purchase and use them for unlimited commercial use. You can find many images that are great for using as backgrounds and there are even images where the background has already been removed and the image was uploaded as a PNG file. PNG files will have a transparent background so the work was already done in isolating the element. A word of warning, though: You should avoid using images with people because you will not have a model release. There is also one more thing to realize, people who put their images in the public domain may do fantastic work but they are undisciplined for producing print-ready images. They may be lazy about removing noise, dust, and specks. But reworking an image of the Colosseum is a lot easier than flying to Rome! One last thing to know before we wrap this up: You will find that working with composite images will be a lot easier if you invest in a graphical tablet and pen. If you're dodging and burning or reworking a hard edge, it's a lot easier using a tablet pen than a mouse. So that's it when it comes to composite images. The potential is unlimited and once you have mastered your workflow you will be able to produce images that have no competition and will have stronger concepts than standard stock photography. Remove the background from an element and then work on techniques that will blend the various layers together into a more natural look and feel. Build yourself a library of backgrounds and elements so you can assembly-line images and increase your output. Utilize images from the public domain to save yourself time and obtain images your normally wouldn't be able photograph on your own. You still will need to learn Photoshop but after reading the above, you should realize that there are only a handful of fundamental Photoshop tools and functions that you need to master in order to create composite images. If you have the passion to create high-end stock images and digital art, you will find yourself having fun with the time you invest. Thanks for reading and I hope this blog takes your photography career to a new level. Please click on the USEFUL button if this has been helpful! Have fun and the next step is up to you! Hi Ted,I'm using Photoshop CC. If you earn enough income the software cost is tax deductible which helps. Interesting article and probably the only way to produce truly unique images. I wonder what version of Photoshop you are using ? I have attempted to isolate parts of images in Elements 15 to produce collages with little success !! Absolutely great article and it has given me lots of ideas for which I want to thank you. Sounds funny and creative work, so I will give it a try! Thank you for the idea! This is a fabulous article! Well, you are right about the advantage of composite images while creating a concept that is otherwise very hard to create in real life. (please excuse me for the poor English :)) I just gave a thumbs up for this article. You gave me lots of ideas..